Are you ready for an advanced, high-intensity circuit training workout? If you've been working out regularly with weights for six months or more with something like the Basic Strength and Muscle program, you may be ready to step up to the next level of your fitness training. I call this the "Serious Circuit" because it involves plenty of iron pumping combined with rapid movement between exercises to keep the heart rate elevated, plus a high-intensity running or cycling component. It's a good one for burning off that little extra stubborn body fat. Note: this is a high-intensity, circuit type workout and you need to have a reasonable fitness to cope with this intensity. If you feel you are not handling it well, do only one circuit rather than degrade the intensity of the workout — or revert to a moderate intensity program. Regular medical checkups are always worthwhile. Seven exercises are included and all the lifts can use dumbbells so that you can do the workout at home as well as the gym. The anaerobic running/cycling component is done three times in each circuit. 1. Dumbbell power hang clean and press. This sounds complicated, and it is an advanced exercise, but not beyond the reach of most people with a little experience. Here's how to do it. Get a gym trainer to coach you in the finer points if necessary. Stand with dumbbells hanging at the sides, feet shoulder-width apart. Thrust the dumbbells overhead with the existing stance, and then return to the hang position. 3. Sixty seconds fast — treadmill, bike, mini trampoline or similar full-body continuous exercise. This is an anaerobic interval designed to be done at a high intensity. It should be done at an intensity of at least 8 out of 10 on an exertion scale of 1 to 10. If you have an indoor or outdoor oval available you can use that. If not, choose either a treadmill or stationary cycle at the gym or home, or run on the spot on a mini exercise trampoline. 4. Standing, dumbbell bent over rows. 7. Dumbbell chest press (horizontal or inclined). Do this one lying on your back or, if you have access to an adjustable bench, on an incline bench. Warm up first. Do 10 minutes walking or jogging on a treadmill, or equivalent, plus a range of light-weight exercises — presses, curls, deadlifts, and squats — to ready the joints and muscles. 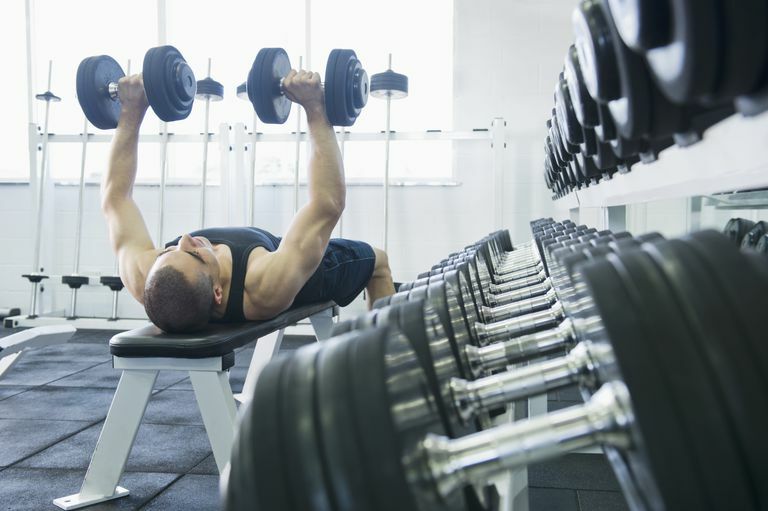 Select a weight that requires you to be working hard on the final repetition of each exercise. You can substitute barbells, where appropriate if you prefer them. Move quickly between the program exercises with minimal rest. Dumbbell power hang clean press. One set of 10 repetitions. Dumbbell arm curls. One set of 12 repetitions. Treadmill run or alternative. Sixty seconds high intensity. Dumbbell bent over rows. One set of 12 exercises. Dumbbell forward weighted lunges. One set of 12 repetitions. Dumbbell triceps extensions. One set of 12 repetitions. Dumbbell chest press (flat or incline). One set of 12 repetitions. Circuit complete. Rest for 3 minutes. Take a little longer if you're not handling the effort well. Try 3 circuits, or two if you're not so fit. A single circuit should take about 15 to 18 minutes depending on access to equipment. Cool down and stretch gently at the completion of your workout. Refuel within 30 minutes with a snack including some carbohydrate and protein. Do no more than 3 sessions a week. You may do other less intensive weights workouts or cardio in that week. Take a break from this workout program every fourth week if you feel overworked. Don't work out if you have acute or chronic pain: Consult a doctor. Good luck with it.